Newswhip's blog published a list of the most viral publishers on the Internet last month, using its Spike database. It's a delicious crackerjack box of goodies for media geeks. 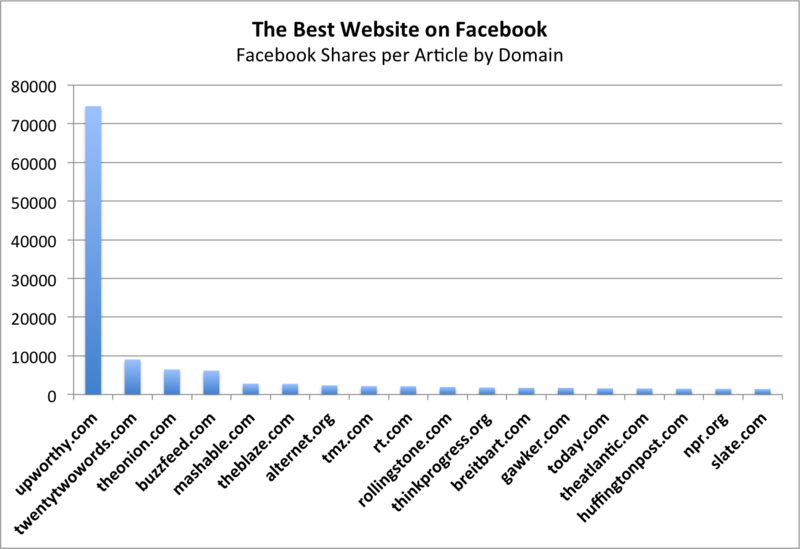 The most important finding, arguably, are the domains with the most Facebook shares. Since traffic to major websites these days is driven mostly by shares on social media, and Facebook is the king of social media, it's fair to say that the sites with the most Facebook shares also have some of the most overall traffic. According to the Spike data, The Huffington Post is still the most "liked" website, followed closely by BuzzFeed and Upworthy. Here's a graph of the top 20. It's mostly large, traditional news organizations like CNN, the New York Times, and Fox News, along with some online superstars, like BuzzFeed, Upworthy, and The Blaze. And here are the most-mentioned domains on Twitter—a very different list, led by more traditional news organizations like the BBC and New York Times. Upworthy turns up far toward the bottom. 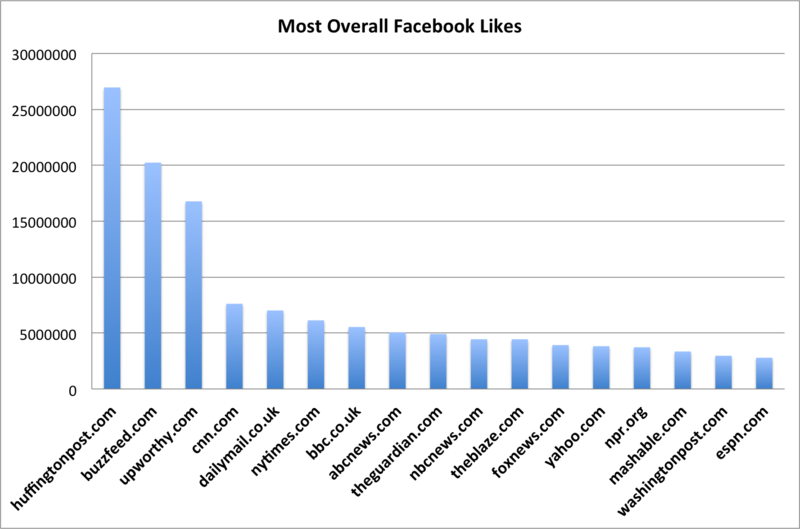 Look at the Y-axis to get a sense of how different this scale is from Facebook's. More on that later. The most impressive thing about Upworthy is that it publishes just 225 articles a month, according to this data. That's one for every 508 articles on Yahoo! The site is so much more dominant than other news sites on Facebook that when you graph its Facebook-shares-per-article, it looks like a skyscraper dropped into a desert. Upworthy averages about 75,000 Facebook likes per article, 12x more than BuzzFeed. 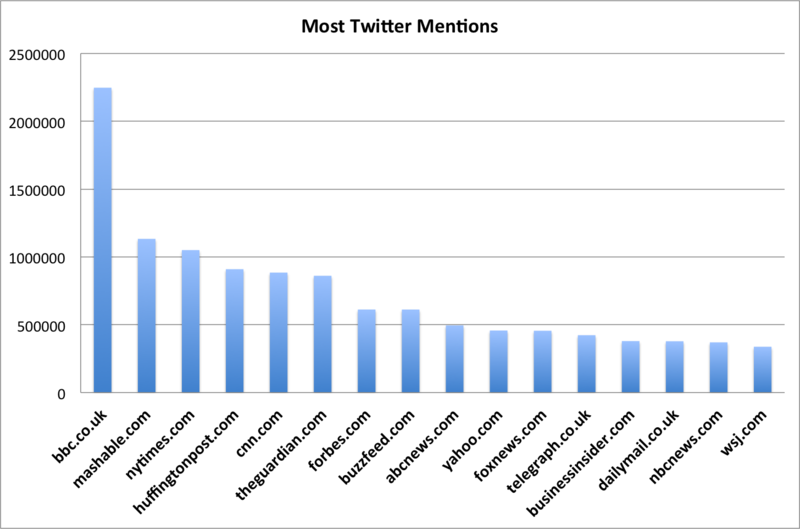 And here's the graph of the domains with the most Twitter mentions per article. Mashable wins, by a wide margin, but not quite as wide as Upworthy wins Facebook. The big takeaway here? Facebook is huge. Much bigger than Twitter. 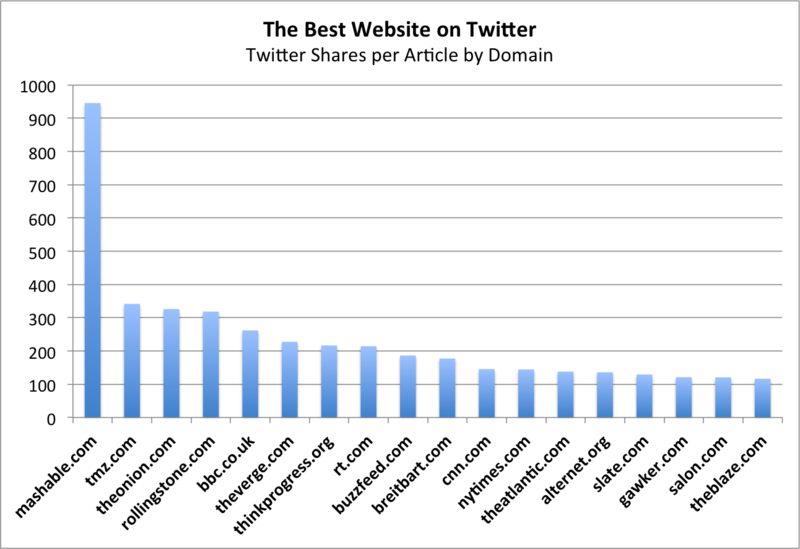 If you take the biggest sites on Twitter and then graph their Facebook shares, here's the picture you get. 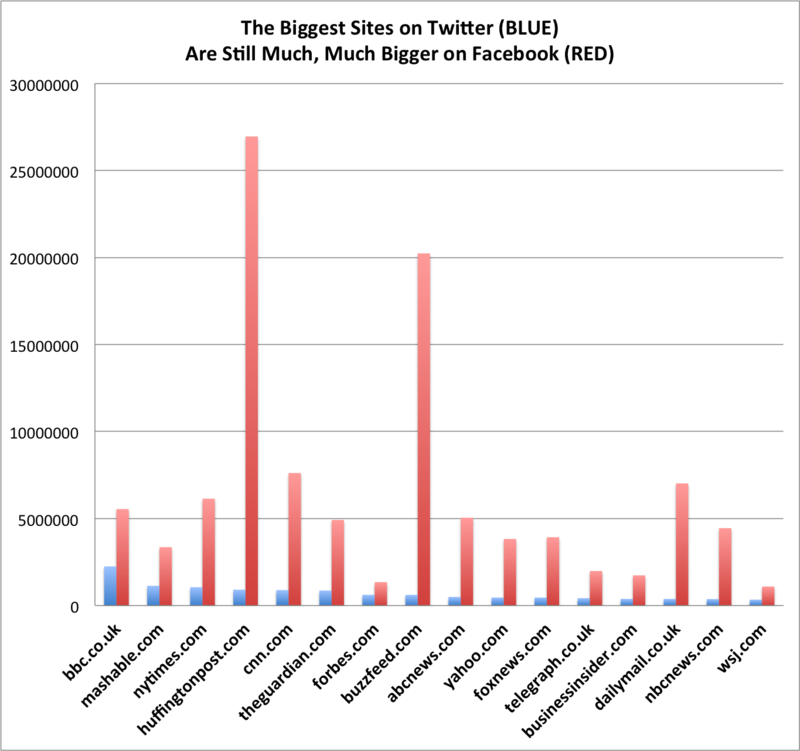 Even the biggest sites on Twitter are much, much, much bigger on Facebook. When it comes to traffic, we're living in a Facebook world. And Upworthy is, for the moment, its king. 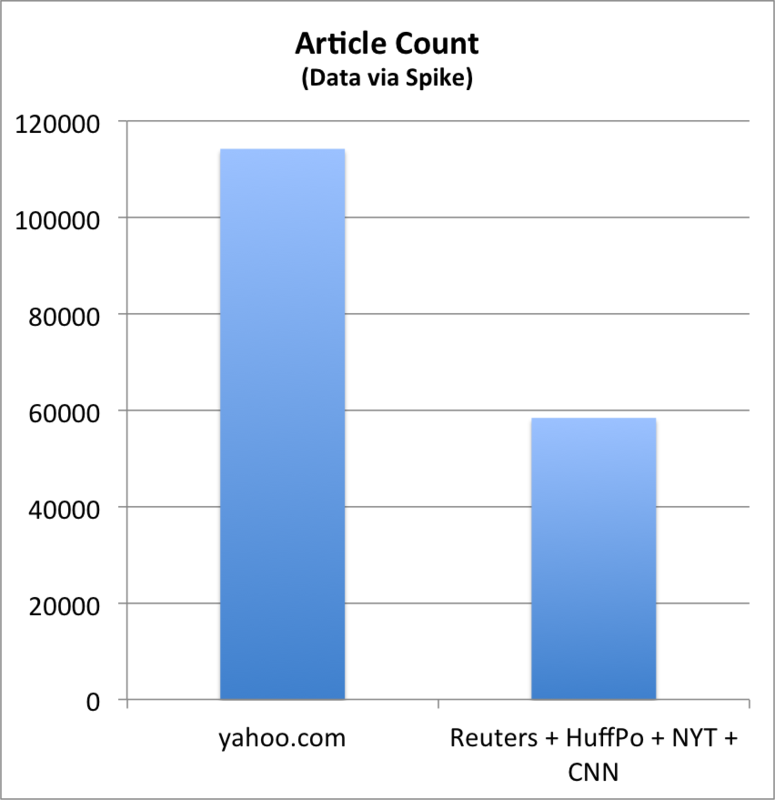 Update: Also from the Spike data: Yahoo! publishes more articles than Reuters, the Huffington Post, the New York Times, and CNN combined ... times two! Sure, these sites are syndicating each other, but still. That is an unbelievable statistic.